There are various ways to execute SQL statements in a mainframe. Using any third party product(vendor) available in your shop like BMC,WINSQL etc. This post is mainly to understand the output of the query which is run through SPUFI. First let’s see the sample spufi output. The weird and interesting thing if you can notice here is,even though the query ran successfully and gave the proper result SQLCODE IS 100 AND NOT 0. Why??? My query ran successfully so,I should get sqlcode 0 right?? The question remains the same rather more aggressive now. “For SELECT statements that are executed with SPUFI, the message ”SQLCODE IS 100″ indicates an error-free result. If the message SQLCODE IS 100 is the only result, DB2 is unable to find any rows that satisfy the condition that is specified in the statement. You have 5 rows in your table satisfying your condition , then set the MAXIMUM ROWS TO BE FETCHED option in the SPUFI to 5 but for this you should know in advance ,the no. of rows your query would return which is not feasible every time. If you set to any value more than 5 it would give SQLCODE 100 at the end. The SQLCODE, if the statement executes successfully. The formatted SQLCA, if the statement executes unsuccessfully. What character positions of the input data set that SPUFI scanned to find SQL statements. This information helps you check the assumptions that SPUFI made about the location of line numbers (if any) in your input data set. Number of output records that are written (to the output data set). 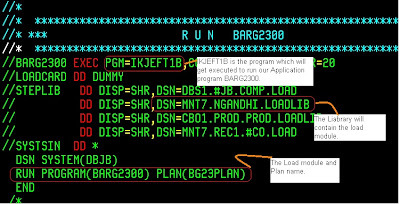 This Post is to understand in detail how your application program runs (and various stages it goes through) on mainframe. What is DB2 Application program? 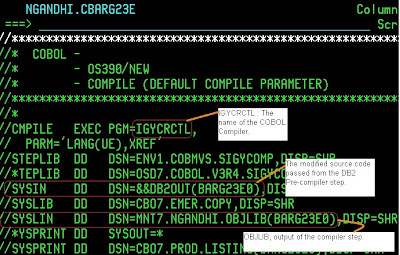 The program written in any High-Level language (In this context COBOL language) which access the data stored in DB2 database. IF we feed the DB2 application program written in COBOL to the Cobol Compiler (IGYCRCTL) it can recognize only Cobol statements in application program and cannot recognize any DB2 statement hence before feeding this program directly to Cobol compiler, we want something which can recognize DB2 statement and separate the DB2 statement from the Cobol program. This can be done by feeding the application program to DB2 Pre-compiler. · The DB2 pre-compiler will comment out the DB2 statement in program and replace them with the CALL statement. This commented DB2 statement will be stored separately in different dataset which is called as DBRM (Data Base Request Module). 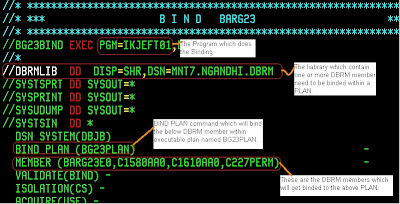 1> The modified Source code (The main program with Commented Db2 statements and corresponding replaced CALL statement. The same (How the DB2-Precompiler separates out the main program in two parts) can be viewed in BATCH JCL. · Place the timestamp token on DBRM and modified source code . This Timestamp token will then carry forward in bot parts and will be checked at the run time when these two separated parts reunite.So at the run time the matching timestamp token will indicate that we are using the same DBRM and Modified source code which get separated at pre-compile step. The pre-compilation timestamp token placed by DB2 pre-compiler on the DBRM can be obtained by checking the value from POS 25 through POS 32 in the DBRM header, which is the first record in the DBRM member. The pre-compilation timestamp token placed by DB2 pre-compiler on the Modified source code can be found in variable SQL-TIMESTAMP-1 SQL-TIMESTAMP-2. SQL-TIMESTAMP-1 (412701320) equals 18995288 in Hex which is the same as the first 8 digits the DBRM. SQL-TIMESTAMP-2 (471453846) equals 1C19D096 in Hex which is the same as the second 8 digits the DBRM. The second part created out of DB2 Pre-compiler (DBRMLIB) will now get processed. The Bind is type of compiler to the SQL statement (DB2 statement).It will read the DB2 Statement from the DBRMLIB and check it for syntax error and create a mechanism to execute the SQL statement. There are two types of BIND, BIND PLAN and BIND PACKAGE. This will have the one or more DBRM, Packages or the combination of DBRM and Package as an input. The BIND PLAN command will invoke the DB2 Optimizer which intern will create the PLAN containing optimized access path to execute the SQL statement inside DBRM. The PLAN created here is an executable and will execute only along with the corresponding Load module created from modified source code through Compile-Link Edit process. None of the PLAN or Load Module can be executed alone. This will have only single DBRM as an input. The Package created here is not executable and need to be bind to plan again in order to get executed. The bind process also updates the Pre-compile Timestamp token placed by the DB2 Pre-compiler on DBRM header in TIMESTAMP column in SYSIBM.SYSDBRM table .PRECOMPTS column will have the regular Timestamp. The columns PRECOMPTIME and PRECOMPDATE will have time (Resolution to 100th of a SEC.) and Date (YYMMDD).Note the remaining flags in the DBRM header will be updated in the first row of SYSIBM.SYSSTMT (for PLAN bind) orSYSIBM.SYSPACKSTMT (for package bind). DB2A gets the details from these tables. So at the start we separated our main DB2 application program into Modified source code and DBRM which then went through two different processes to create the LOAD module and PLAN respectively. Now just before running the program we need to reunite these two and run our main DB2 application program. While running, the Timestamp token placed by the DB2 pre-compiler on both part (Plan (fromSYSIBM.SYSDBRM) and Load module) will be checked. We will get the SQLCODE of -818 if the Timestamp between two doesn’t match. Note : Click on the images to get bigger view. In first part we discussed about, what the cursor is and why we need it. In this part we will discuss about the types of cursor. Yes there are different types of cursor and they work differently depending on their type. In normal or simple cursor the data can only be retrieved one row at a time in forward direction using "FETCH" statement. With Scrollable cursor, you can scroll forward/backward through the data(Result set of select statement) in an application program. Ok but before everything else how do you distinguish that the cursor defined in the program is scrollable or not. The keyword "SCROLL" is use to specify that the cursor defined is scrollable. Ok so this is how you define it.Now, how does it work? how do you move through the data? Similar to normal cursor, Fetch statement is still used but is combined with different keyword to move the fetching in specific direction. FIRST :- This will fetch the first row in the result set. CURRENT :- This will fetch the current row from the result set. Similarly there are different keywords like LAST,NEXT,BEFORE,AFTER,PRIOR etc. Fetch first statement will position the cursor to the first row of the result set and then fetch it to the defined host variable. Scrollable cursor makes it easy to scroll through the data thus saves amount of time and effort. There are two types of scrollable cursor. Yes there are again types of scrollable cursor but it make sense to understand on what factor they are diffracted. However, Inserts will not be reflected in the result set. Though easier to use , you should not define every cursor to be scrollable as it require more overhead to the normal/conventional type of cursor. To be specific , if you do not need to move forward /backword through the result set do not use scrollable cursor. Until now we saw that using cursor(be it any type) we can fetch only one row at a time.We can also fetch multiple rows using single fecth statement in a cursor. How do you do it?? we will see it in next part.